We have decided to use the hot air balloon for the symbol. The venue, ItalianBenevolentSociety, was very inviting - the ceiling is 20' or so. The main decoration for the event was the hot air balloon, almost real size! Not really real, we did not want the building fly away, but we use all the space floor to the ceiling. For the big balloon we have used 8 footer, my beloved size! Yes, we have cheated a little - the basket did not have the bottom - so that people could get inside to be taken pictures of. But we forgive ourselves, our photographer do not have a back drop like that every day! 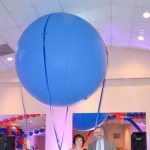 To drive the point all the way home, the centerpieces on the tables were also hot air balloons. The balloons in this case were smaller , but they were colored as globe! Every table had a country for the name and placement cards were directing guests to their tables by the country. Good so far, but how do you know where to go? You can not travel without clear idea of where you go. So the next main thing you need is compass. The real one is good, but too small to be a decoration item. So we made one 10' in diameter. 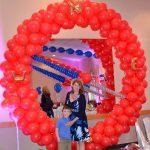 The needle of the compass was created from long balloons that twisters use to create balloon animals, which is slightly unconventional in our area of balloon decorations, we do, for the most part, everything out of round balloons 11" or larger, sometimes small round 5" balloons. But the needle must be very thin, so we take the unconventional root. One thing I do not know, on a real hot air balloon, if you see (with the help of the compass) that you are moving in the wrong direction, what do you do? So the travel part of the party was presented and illustrated very well, what about the 50th birthday? 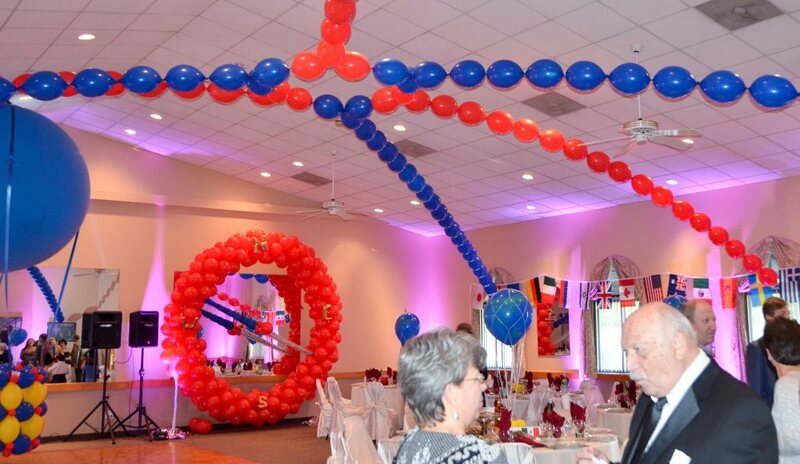 Yes, number 50, balloon sculpture of number 50, is the first thing that the guests see when they enter the room. Even if you do not know why you are here, you will be informed right away! And, to bring all of this decorations together , we have created a dome balloon sculpture. It works only in the rooms with a very high ceiling, but when this is the case - this is the best designer's solution. Ceiling is no more "flat" or "just white", it has texture and color, and, as I said earlier, all parts of the room become one welcoming space, not separated islands like tables in a big restaurant. Some decorations can become part of entertainment. That was the case with the hot air balloon. Getting inside the basket for picture taking was not an easy thing. You have to crawl under the basket in order to get in. What if two or three people want to get in the basket together? Traffic problems! 2. Look at the room together with the client. Most people do not remember details like height of the ceiling, number of windows and so on. It might happen that the client order something that will look awful (for example an arch in a low ceiling room. it visually brings the ceiling even lower). Planning the decorations in the space solves that problem. 3. We come up with two or three plans of decorations, based on customers likes and dislikes and then the most interesting part comes in. We create together by cutting and pasting the plans, coming up with absolutely new ideas and putting together the final plan. Client knows exactly what he or she is paying for. Well... Not exactly... Most often, even though the everything was planned together, the end result is larger and brighter than client expects. We would like to provide this wonderful service to you! The post about the party would not be completed without a few kind words about our catering company Igor Catering. Occasionally we service the same parties for more than ten years. When asked, we recommend this company and got a lot of gratitude. Why? What they do so much better than other caterers? What can be said about a service that is practically perfect? The food is very testy, the presentation is excellent, the team is above any compliments. I hear the complements and "thanks" to the caterer from the customers every time we work with Igor. I see how the team work during the preparation time. Our team has to cooperate in some cases to get in the venue at the same time, which can be a problem. But not with this team. Everything is seamless and easy. Now, so many years and parties together , our teams even help each other if needed. It does not happened every day with every team! But I am not only the person who recommends Igor Catering. A few months ago my parents-in-law had a golden anniversary. 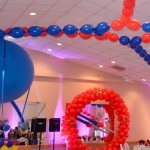 So we had a big party, one of the best balloon decorator of the century was invited to dress up the room (what was the name of the company...? I think it was WOW! Balloons, Inc. !) . Guess who was invited to cater for the significant event? That is right, Igor Catering. As a client, I have to admit, it was the easiest thing in the world to deal with the company. As a guest, I will go even further: they cook too tasty! One can eat only so much, but everything they serve was demanding to be eaten, at least tried. So I eat more than so much. I wish we always have problems like this. To make the long story short: you need a GREAT CATERING COMPANY? Give us a call, we will put you in touch and you will get even better service!